Caldwells are the New Forest’s leading Independent Estate Agent with a prominent and dynamic sales office in the vibrant centre of Lymington. The properties we have for sale are available throughout the New Forest area including Beaulieu, Brockenhurst, Lymington, Lyndhurst, Milford on Sea, Sway and all surrounding areas. Our extensive property register covers the full range of local property available, whether residential property, commercial property, retirement property, equestrian properties, land or new homes. Whether buying or selling, Caldwells offer a property service that is second to none. 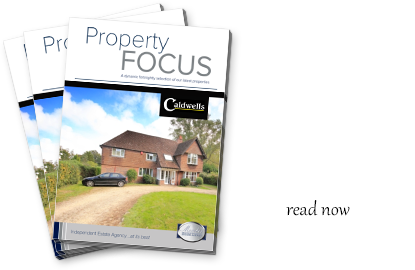 With our many years of local experience in the New Forest property market, we have built up a strong and dedicated team of professional and highly motivated full and part time property specialists whose local knowledge and experience ensures that the best possible service is offered to all our clients at all times. With our strong London connection through the Guild of Professional Estate Agents, we are the only Lymington agent to promote our homes through their prestigious offices in Park Lane. "Dear Will, Just a quick line to thank you for helping us to get our dream home. Best wishes, Mr & Mrs E"
"Dear Will, I just wanted to write and say thank you so much for all your hard work in helping me achieve completion on my new home. I am going to be very happy here. My best wishes to Sandy. Kind regards." "Dear Jeremy, Just a quick note to say thank you so much to you and your colleagues for all the assistance given over the last few weeks, it's been first class! We love the new house and are looking forward to putting our own stamp on it. Thank you also for the card and gift bag, the champagne went down very well last night!" "Dear Jeremy, Just a belated note to thank you and your team very much for making the sale and move so successful. The help and advice along the way was always succinct, and the handover with bubbly and ‘happy new home’ card was particularly appreciated. Others have asked my opinion of the service provided and I have recommended your name without question. Again, many thanks indeed from us both. Best." "To Jeremy & team. Thank you so much for your support. Truly awesome. Please also convey my thanks to Scott Bailey. Thank you again." "Hi Will, Just a short note to say a sincere 'thank you' for your help in getting our purchase to completion - it would have been a nightmare without your help!" "We are absolutely delighted to become the owners of our new cottage. I personally fell in love with it immediately and managed to persuade R eventually that it would be ideal for us! It has been a pleasure dealing with Caldwells - I dont think you have seen the back of us yet!!" "Thank you very much! Huge thank you to Will and the team at Caldwells! Thanks for hanging in there! Have a great Xmas & New Year!" "Thank you so much for all your hard work & consistency in selling our house. (We) would have no hesitation in recommending you to anyone wanting to sell. Everyone has been so helpful." "I know this has been said before however I am writing today to extend our thanks and appreciation for the sale of our property conducted by Jeremy, Julian and Sandy. Very many thanks for the care you and your team have taken in looking after us - sometimes it seems easy just to care for those with more valuable properties around simply on the grounds of 'larger returns to the company', but originating from smaller fish, bigger fish materialise and word gets around! Well done - our sincere congratulations and a huge thank you to Caldwells!" "To Jeremy & Will, Many thanks for all your advice. With kind regards." "Julian - With grateful thanks for ALL your help, we couldn't have managed without you." "Just to say thank you to everyone at Caldwells for all of your efforts in helping us to sell our cottage. We will still visit Hampshire I am sure as it is a beautiful part of the country. Thank you once again." "Dear Jeremy and the Caldwells team, Just wanted to say a big thank you for all your help in purchasing my property, very much appreciated." "Thank you so much to you and your staff for sending the champagne etc. on completion of the purchase of our new home. We very much look forward to starting work on it. Also, thank you for all your help and assistance to complete this purchase." "I owe thanks to you all for finally achieving the successful sale of my house - and particularly to Dominic for finding the purchasers. I am always so impressed by your brilliant teamwork and the pleasure it was to speak to any of you on the phone and the friendly reception in the office. I will miss being in contact with you! With every good wish for the continuing success of Caldwells and with many thanks for all you did on my behalf." "Dear Julian, Just a little note to say a big thank you for all your help while I was viewing, buying and moving in to the flat. Many thanks to all your team who were so helpful every time I rang or popped in to the office. I greatly appreciate the bottle of bubbly - not consumed yet, waiting for my brother to visit. Best wishes." "Delighted we have chosen Caldwells to market our much loved family home. Very professional, nothing is too much trouble and the details and advertising coverage are excellent. Thanks to all of the team." "Dear Julian, Thank you all very much for acting and achieving success for us in the sale of our property. Also, thank you for the champagne - very much appreciated. We will celebrate and drink it when we have finally finished the sorting out - it will probably be vintage by then!" "To all at Caldwells, thank you for all your help during our "stay" in Lymington. Please find enclosed a little something for you all to share. Best wishes." "Dear all the lovely Caldwells crew! Thank you for helping me purchase my first (very pink) house. I'm so excited!" "Just wanted to say a big thank you for all your assistance in making our move as easy as possible. We know you were representing your Vendor, but your efforts and support was excellent. Please also thank your colleagues for the bottle to celebrate our arrival in Everton." "Richard and I wanted to write to formally express our thanks to you for helping us find and buy our new home. In particular, thank you for your consistent professionalism reflected in many ways. We always felt that you acted in the best interests of both us and the vendors , you listened to our needs for a new home and made many appropriate suggestions and you communicated with efficiency and friendliness. You and Caldwells provided exactly the type of service that we would want from a top range estate agents. Thank you!" "Dear Caroline, Thank you so much for your assistance in my move to Lymington. I have only just recovered and don't want to do it again for a long time! Your support during the transaction was invaluable." "To Jeremy and all at Caldwells - Many thanks for all your help with the purchase of our new property." "I just wanted to drop you this line to say how much we appreciated your coming round to sort out our hot water system. Thank you so much once again for saving our sanity on Saturday evening and for your infinite patience in getting everything working. Please accept our sincere gratitude and thanks again." "We have now moved in! Many thanks for your help - appreciate the friendly and personal touches Caldwells consistently provided. Hopefully we won't be looking for an Estate Agent in the near future, but I will recommend your services." "Thank you for the champagne and card we received upon arrival at our new home - what a lovely surprise! We are grateful for all your care and help over the last year." "Thank you both for managing the sales of my two properties. Excellent service as always!" "To Jeremy and all the staff at Caldwells - Huge thanks for all you have done in the sale of the cottage. It has certainly been a pleasure to deal with you. Very best wishes." "To all at Caldwells, a belated thank you to you all for the efforts, thought and help you offered during our somewhat prolonged sale. Your extra help in the final stages was greatly appreciated. It was a pleasure to have received your service." "To all the staff at Caldwells (and especially Caroline!) Thank you so much for making a difficult job in selling my mums house so much easier. Your sensitivity and professionalism plus the exceptional friendly service was much appreciated." "I write to thank you at Caldwells Estate Agency for the professionalism shown in the sale of my property. It was reassuring for me to see how efficiently the sale proceeded until the completion on 12th January 2015. I trust that 2015 will be a good year for you all and a successful business one." "Thank you for all your help and support and for getting our bungalow sold at a very good price. We were very impressed with Caldwells - you all have a very professional approach, everyone was helpful, courteous and friendly and if you said you would phone back, you did. You fully deserve your silver award and we are sure you will gold next year. Thank you again for your patience and super service."